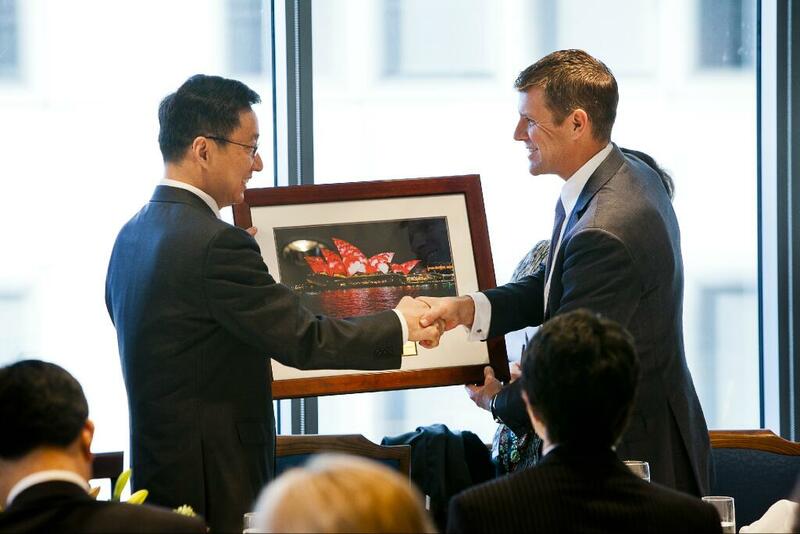 Mike Baird, former Premier of New South Wales, Australia, displays a Tubal-Cain Masonic handshake on 3rd June, 2014 with Han Zheng, representative of the Communist Party of China, and presents him with a picture of the Sydney Opera House in ?Chinese red?. The control that the Rothschilds-led synagogue of Satan, also known as the satanic Illuminati, exerts upon the world is shaped like a pyramid with the Rothschilds and other wealthy banking families at the apex. The lower levels of the pyramid represent the means by which the synagogue of Satan has its orders and directives carried out throughout the world. The non-Jewish foot soldiers of the synagogue of Satan who do its bidding throughout the world, wittingly or unwittingly, are the several million non-Jewish men worldwide who are involved in Freemasonry. Pauline Hanson's role as the leader of the One Nation political party is to control the opposition to the globalisation and world government agenda of the Rothschilds-led synagogue of Satan (ie. the many Australian citizens who are opposed to it) and to discredit them by her own actions so that other Australian citizens won?t be inclined to embrace this same opposition to this globalisation agenda. This was her role when she became a member of the Australian Federal Parliament in 1996 and it's her same role today, now that she's returned as a member of the Australian Federal Parliament in 2016. This web page includes evidence to support the contention that the One Nation party was created by the Liberal party of Australia to manage the opposition of Australian citizens to the world government agenda that the Liberal party of Australia (and the Labor party of Australia) has been actively and deliberately carrying out on behalf of the synagogue of Satan, which controls the Liberal party (and the Labor party) in an ironclad manner. Former Prime Minister and Freemason Tony Abbott played an instrumental role in the creation and management of the One Nation party in the mid-1990s and probably still plays a role in the management of this party. Both of these organisations, Freemasonry for non-Jewish males and the Order of the Eastern Star for non-Jewish females, are satanic organisations which both serve the synagogue of Satan and which are both controlled by the synagogue of Satan. Both of these organisations claim that their members are engaged in charitable works for the benefit of their fellow man, in order to cover the reality that both of these organisations are satanic in nature and serve the synagogue of Satan. Whether Freemasons realise it or not, Freemasonry is a satanic organisation which serves Satan, just as the synagogue of Satan is knowingly satanic in nature. Wittingly or unwittingly, Freemasons are furthering the purposes of the synagogue of Satan towards world government. We are living under contemptible circumstances in which many politicians who lead our countries belong to the occult, secret societies of Freemasonry, in the case of non-Jewish males, and the Order of the Eastern Star, in the case of non-Jewish females. They hide their membership of these organisations from the citizens under their ?leadership? and they are actively working towards the implementation of the agenda of the synagogue of Satan to establish world government. Freemasonry is led and controlled by the synagogue of Satan, which is evident from the 4th and 5th points of the 15th Protocol of the Learned Elders of Zion, found on the web page, biblebelievers.org.au/przion5.htm#Protocol No. 13. The synagogue of Satan has worked feverishly to try to convince citizens investigating the Protocols of the Learned Elders of Zion, that this manifesto is fake, however the most cursory reading of the protocols reveals that they are chillingly authentic, completely true to our experience of world affairs and revealing of the innate evil and deceit that is motivating our enemy. Claiming that the Protocols of the Learned Elders of Zion is fake is like calling somebody a ?conspiracy theorist? because they reject the official story surrounding 9/11. It's a desperate attempt to prevent the truth from taking root amongst the populace. The several million Freemasons throughout the world are the non-Jewish agents by which the synagogue of Satan both stays up-to-date on what is happening throughout the world and has its plans carried out. Freemasons are the feet-on-the-ground of the synagogue of Satan, whether they know it or not. Many non-Jewish members of the organisations listed on the page, ?Globalist? organisations, such as the Council on Foreign Relations, the Club of Rome and the Bilderberg Group, are Freemasons. Many of the churches that Christians attend in the western world are led by Freemasons pretending to be followers of Jesus Christ - wolves in sheeps? clothing. Here is a non-exhaustive list of Christian leaders in the western world who are Freemasons pretending to be followers of Jesus Christ. Freemasons pretending to be Christian leaders distort the biblical notion of love to justify the toleration of moral compromise such as homosexual marriage. They are wolves in sheeps? clothing whose purpose is to knowingly lead the church of Jesus Christ astray on behalf of the synagogue of Satan in which they are knowingly involved. The reason why Freemasons pretending to be Christian leaders tend to remain undetected for a long time is that most Christians under their leadership, who typically finance their leadership with their giving, have better things to do with their time than scrutinise the legitimacy of their leadership. Most Christians are understandably busy with other things. However, it?s now apparent that continuous monitoring of people occupying positions of Christian leadership is essential for the health of the church of Jesus Christ. Because of the importance of this monitoring, it?s a task that is best shared amongst all of the Christians in the church of Jesus Christ, so that the burden on any one individual is greatly reduced and much more manageable. Genuine Christian leaders will find that they have nothing to worry about whatsoever in the face of such monitoring, since it shines a spotlight on the worthwhile work that they do. Your assistance in detecting Freemasons in positions of leadership in every sphere of society is urgently needed and greatly appreciated because they are literally everywhere. The best way to detect Freemasons is to look for one of their secret signs. There are quite a range of secret signs that Freemasons have been known to make. Since this range of secret signs that Freemasons make is beyond the scope of this website at this time, it?s recommended that you search elsewhere for information about them. There are many other websites that have documented them in detail. Andrew Robb sung the praises of the Trans-Pacific Partnership in the face of opposition to this trade agreement from multiple hundreds of thousands of Australian citizens, who he treated with disdain. The National Student Leadership Forum is designed to influence up-and-coming, young-adult leaders to embrace and support our flawed system of 'representative' democracy here in Australia instead of pondering sensible alternatives such as direct democracy, in which citizens vote voluntarily via the internet or via telephone on every single issue upon which our elected 'representatives' currently decide on our behalf. Jock Cameron is a brother of Freemason Ross Cameron and a son of Freemason Jim Cameron, former member of the State Parliament of New South Wales in the Legislative Assembly, now deceased. Have you ever been involved in Freemasonry and, if you have, are you currently involved in Freemasonry?? If they refuse to answer this very simple question, this obviously serves to increase your suspicion that they are involved in Freemasonry. There is no justifiable reason for any honest leader to refuse to answer this question.